Vancouver, BC – October 12, 2017. The British Columbia Real Estate Association (BCREA) reports that a total of 8,340 residential unit sales were recorded by the Multiple Listing Service® (MLS®) in September, an increase of 9.9 per cent from the same period last year. Total sales dollar volume was $ 5.8 billion, up 30.2 per cent from September 2016. The average MLS® residential price in the province was $693,774, up 18.5 per cent from September 2016.
" BC home sales rose nearly 5 per cent from August on a seasonally adjusted basis," said Cameron Muir, BCREA Chief Economist. "Total active listings on the market continue to trend at ten-year lows in most BC regions, limiting unit sales and pushing home prices higher. While the economic fundamentals support elevated housing demand, rising home prices are eroding affordability, particularly for first-time buyers." 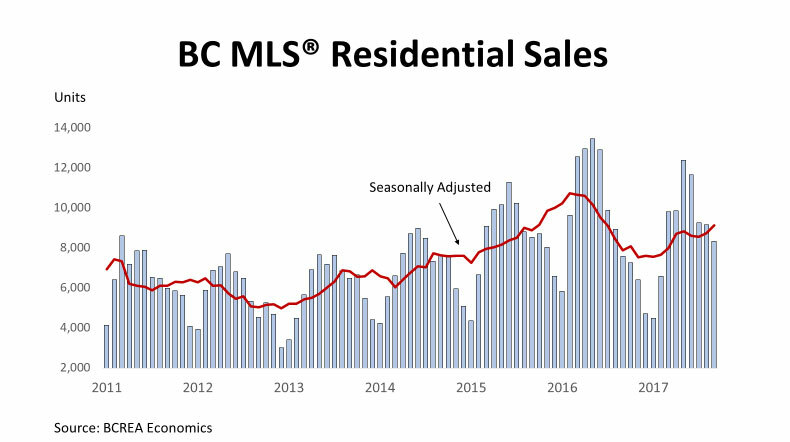 Year-to-date, BC residential sales dollar volume was down 12. 8 per cent to $57.6 billion, when compared with the same period in 2016. Residential unit sales declined 13 per cent to 81,608 units, while the average MLS® residential price was down 0.2 per cent to $705,501.